Democrats have always claimed to love unions, all unions, any unions, but, in that typically hypocritical Democrat fashion, when it comes to unionizing their own groups… well, suddenly the idea of organizing employees is not so wonderful. Because the Democrats are not acting as if they love the Campaign Workers Guild. According to NBC News, a new group is trying to organize the lowly volunteers and workers on political campaigns but so-called “progressive” liberals are trying to torpedo the effort before it even gets started. NBC published “Democrats love unions. Just not for their own campaign workers” on April 15 to slam liberals who espouse their love of unions even as they work to kill an effort to force political campaigns to pay a “living wage” to campaign workers. Of course, the idea is stupid. If successful, unionizing campaign workers would add millions to the costs of running for office and bring even more money — not less — into the game of politics. 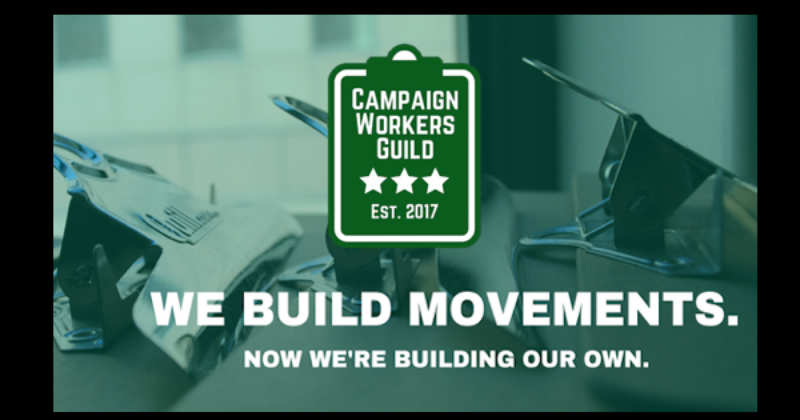 But now a new group calling itself the Campaign Workers Guild (CWG) is attempting to create a new union for political campaigns of all stripes, not just for Democrats. According to the Campaign Workers Guild website, the group wants to “improve working conditions” for campaign workers. Yet, NBC found that Democrats are not very interested in this idea despite the left’s claim that unions are an indispensable part of the workplace. “While the CWG declined to say how many campaigns they’ve tried to unionize or discuss ongoing efforts, they acknowledged encountering resistance from progressive candidates and organizations,” NBC said in its report. NBC also noted that the Democrat Party in Washington DC has remained mostly silent on the unionization effort. Interestingly, NBC also found that even as the Democrat National Committee recently began paying its interns, it is the Republicans who are far more likely to pay interns than Democrats. NBC next happily noted that unions are reaching “beyond their traditional industries.” But, the truth is, despite NBC’s sunny optimism, unions are still declining overall, not growing. A few years ago, Forbes magazine noted that “In 2013 the unionized workforce in America hit a 97 year low. Only 11.3% of all workers were unionized.” By 2016 that number had fallen to 6.4 percent, America magazine reported. The decline in unionism may also have contributed to Donald Trump’s narrow win in some of those formerly deep blue states that were once ruled with an iron fist by unions. According to Daily Signal, the relative weakness of unions allowed many union members to vote their consciences for Trump instead of being browbeaten into supporting Hillary to please union bosses. Now, this far from the first time liberals have worked to prevent their own from organizing. To name a few examples, back in 2010, the United Federation of Teachers, America’s biggest teachers union, fired one of its own employees because he was trying to organize a union at UFT headquarters. That’s right, a union fired an employee for trying to organize a union! A similar thing occurred in 2015 at the United Food & Commercial Workers International that employed non-union employees at its offices but got all tweaked when those employees tried to organize. In any case, the new union is undaunted. A representative of the CWG insisted that if a candidate can’t pay staffers a “living wage,” then he shouldn’t be a candidate at all. Naturally, liberals are desperately trying to avoid the elephant in the room. For years– especially with the Bernie Sanders campaign — Democrats have been railing about trying to “get money out of politics.” But if campaign workers are unionized, that can only drive the costs of running for office higher than ever meaning that even more money will have to be pumped into politics to satisfy union demands. Even if it pumps more money into politics, watching the supposed pro-union Democratic Party fight unionization is going to be fun to watch. Folks, It’s time to purchase the big bag of popcorn.